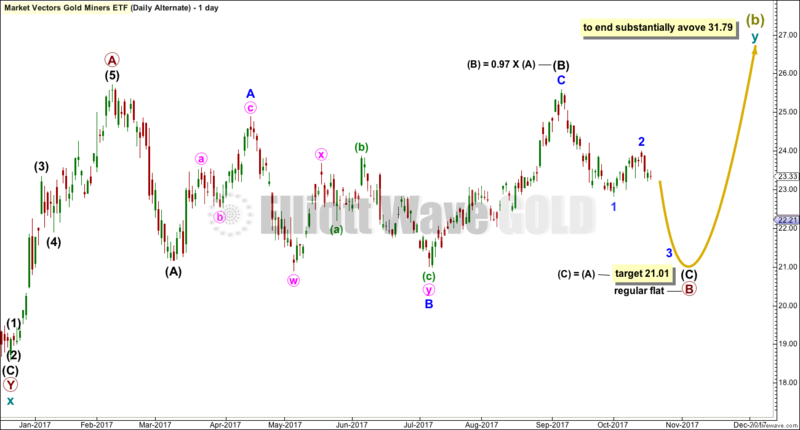 Last Elliott wave analysis of GDX was almost a year ago. Summary: The situation is now somewhat clearer after a strong breakout from a very long consolidation. 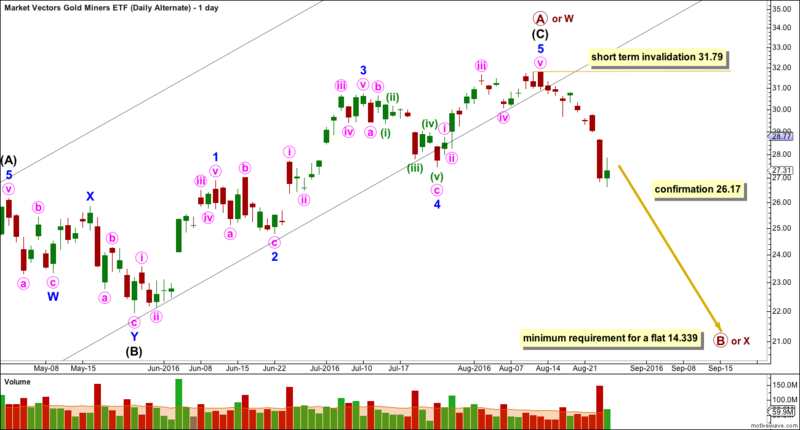 Only one Elliott wave count is now published for GDX. It is my opinion based upon experience that this market does not have sufficient volume for reliable Elliott wave analysis, which is why I do not provide it on a regular basis. Classic technical analysis would be a better approach for this market, which is why I provide it daily to members. 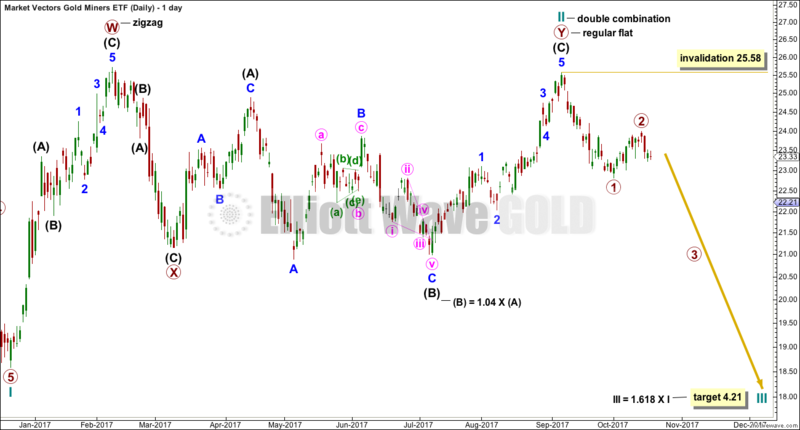 For members who are interested in an Elliott wave count of GDX, I am providing it here. This analysis should be used only as a general guide. 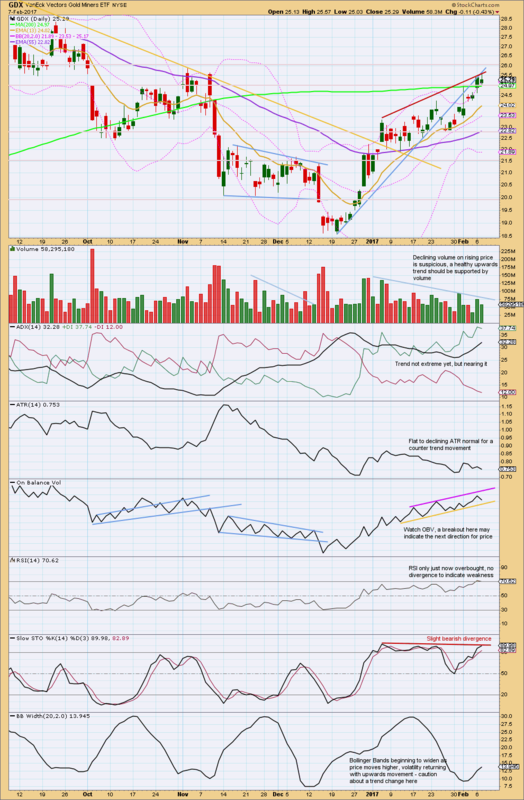 For a more reliable guide see the daily GDX technical analysis provided at the end of each Gold analysis. From September 2011 to January 2016 this downwards wave fits best as a five wave impulse. 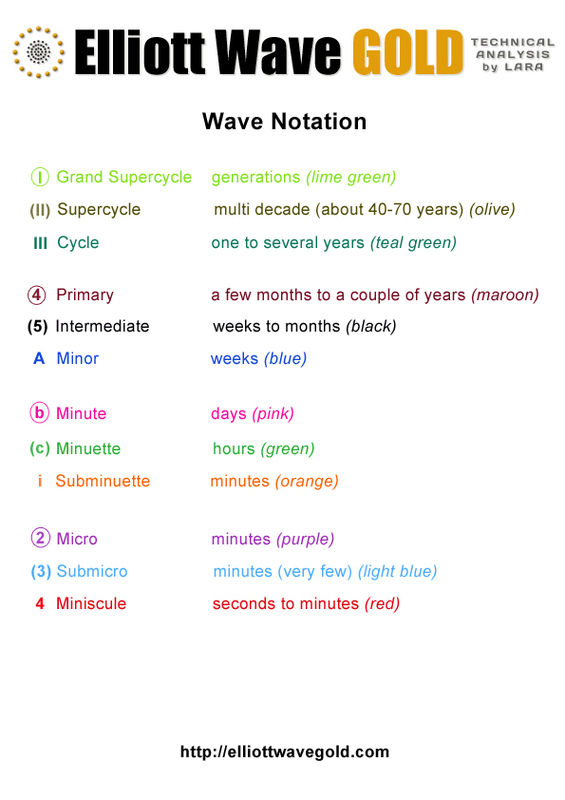 The downwards five is labelled Super Cycle wave (a). If this downwards wave is a five, then it should be followed by a three up and then another five down. The following three up labelled Super Cycle wave (b) would most likely be incomplete, and it would likely last longer to have better proportion to Super Cycle wave (a). Super Cycle wave (b) would most likely subdivide as a zigzag, although it may also be a flat, triangle or combination. None of the more than 23 possible corrective structures can be eliminated because it is not possible to have full confidence on the structure of cycle wave a within it. If cycle wave a is a five wave structure (which it fits best as), then Super Cycle wave (b) would be indicated as unfolding as a zigzag. 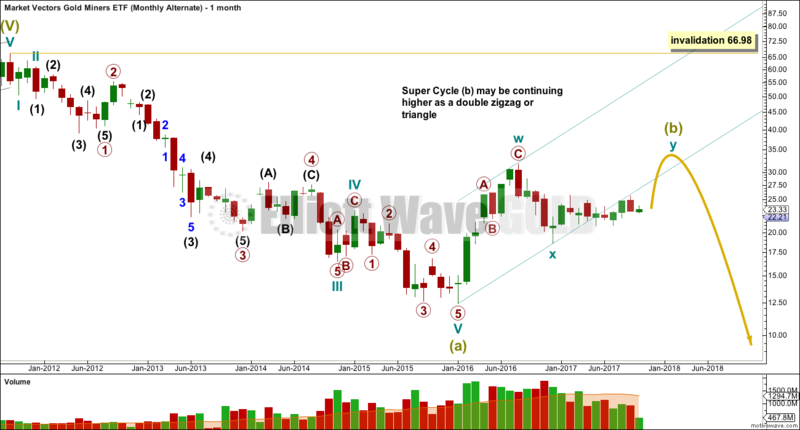 Within the zigzag, cycle wave b may not move beyond the start of cycle wave a below 12.40. If cycle wave a is a three wave structure (a zigzag), then Super Cycle wave (b) may be any one of a flat, triangle or combination. 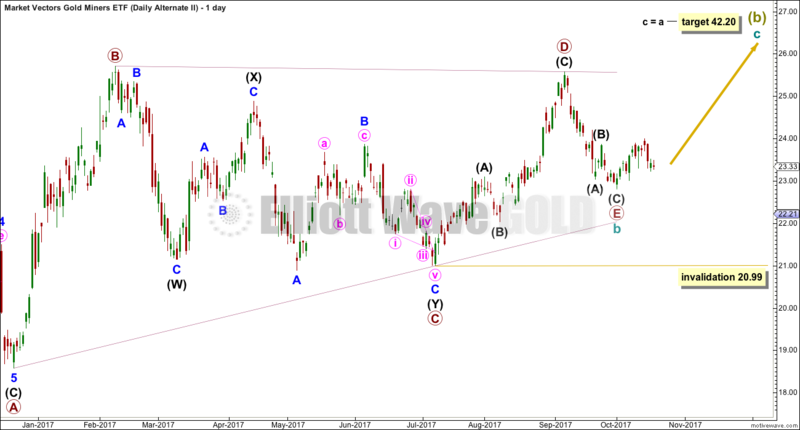 Within an expanded flat, running triangle or combination, wave b (or x) may move beyond the start of wave a (or w) below 12.40. 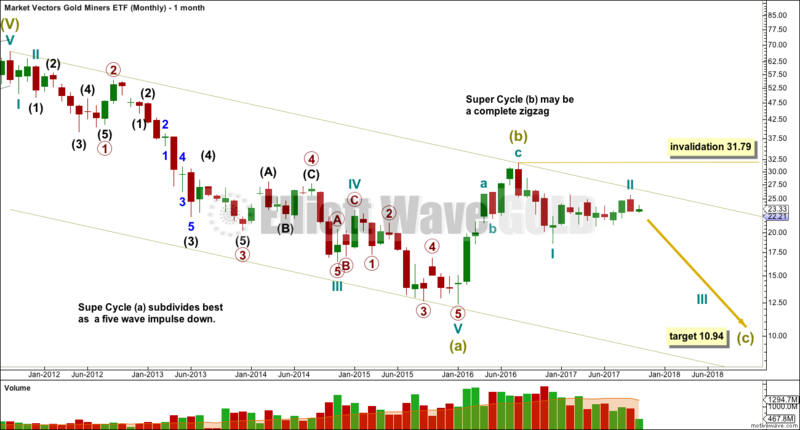 The weekly chart below looks at the structure of Super Cycle wave (b) so far. 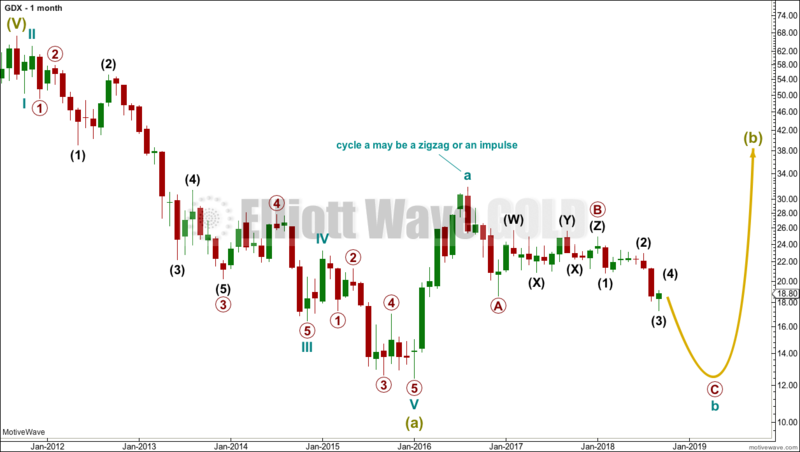 If cycle wave a is an impulse, then cycle wave b may not move beyond its start below 12.40. If price makes a new low below 12.40, then cycle wave a would need to be relabelled as a zigzag. 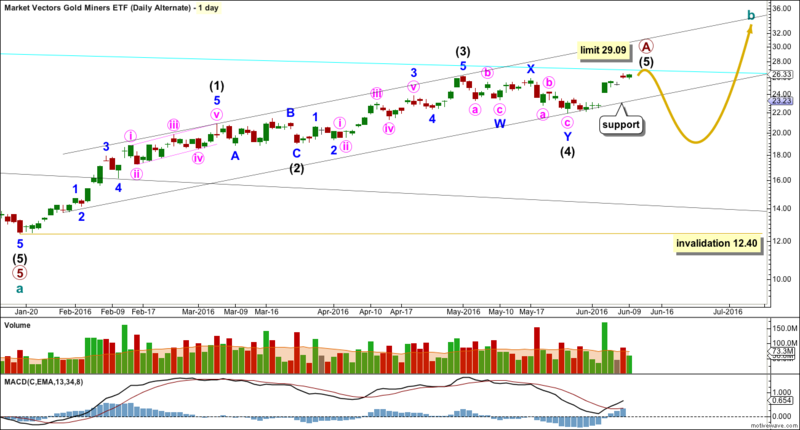 Cycle wave b looks best as an incomplete zigzag. The last strong downwards wave looks like a third wave, which is labelled intermediate wave (3). The structure of primary wave B is very difficult to analyse. Although it looks like a triangle, and a triangle will fit, a triangle looks wrong. The trend lines would either not converge or would not be adhered to. After considering several different possible structures the only one which has a good fit is a very rare triple combination. Primary wave C must complete as a five wave impulse. So far intermediate waves (1), (2) and (3) may now be complete. 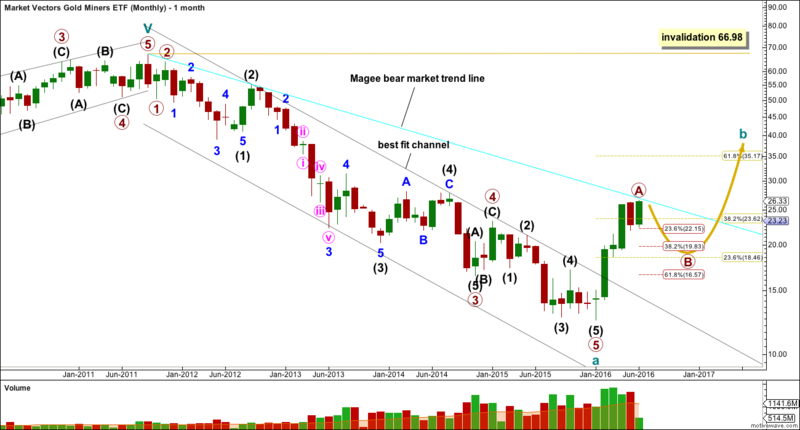 Intermediate wave (4) may not move into intermediate wave (2) price territory above 20.83. Intermediate wave (4) would most likely subdivide as a zigzag or zigzag multiple to exhibit alternation with the combination of intermediate wave (2). Intermediate wave (4) may end close to the 0.382 Fibonacci ratio to exhibit alternation in depth with intermediate wave (2). So far minor wave A looks like it may be a complete five wave impulse. If that piece of this wave count is correct, then minor wave B may not move beyond the start of minor wave A below 17.28. Minor wave B may move sideways for several sessions, or it could be a quick sharp pullback over in just a few days. There are multiple structural options for minor wave B; B waves exhibit the greatest variety in structure and price behaviour. When minor wave B is a complete corrective structure, then minor wave C would be most likely to make at least a slight new high above the end of minor wave A at 19.11 to avoid a truncation. Minor wave C may end only slightly above the end of minor wave A at 19.25 to see intermediate wave (4) end about the 0.382 Fibonacci ratio. Published @ 04:36 a.m. EST. For most recent movement, this wave count has the best fit in terms of Elliott wave structure. It does look like a barrier triangle has recently finished, which may be cycle wave b. 1. The breakout from this multi month consolidation should be upwards. 2. 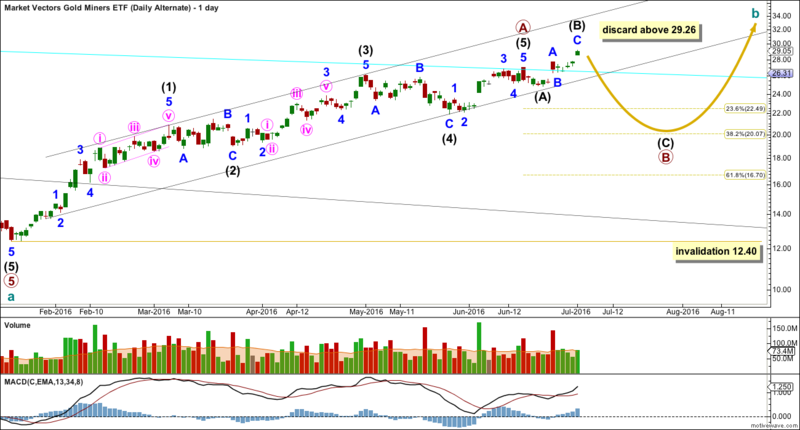 After an upwards wave to last one to several years, GDX should then turn downwards for wave C.
Published @ 02:20 a.m. EST. Last analysis expected upwards movement to continue towards a target at 1,320. Price did make a new high but was well short of the target. Upwards movement continues and price has remained within the upper half of the channel on the hourly chart, which was expected at this stage. Trading advice is given to members to manage long positions towards the end of this week. Upwards movement was expected. Price moved lower, but has rebounded strongly after the session closed. Downwards movement remained above the invalidation point on the hourly chart. The Trading Room is a new idea that I want to test and develop over the next few months. I find myself spending a lot of time writing and publishing analysis of Gold and the S&P500 (over at Elliott Wave Stock Market) when those markets are quiet and range bound and offer no good trading opportunities. This focus on inactive markets takes focus away from markets that are trending and do offer good trading opportunities. What if the focus was on finding good trading opportunities over a range of markets rather than daily analysis of specific markets? What if the Trading Room can be the platform for publishing these good trading opportunities? Therefore, this Trading Room approach will look over a range of markets to identify any possible trading set ups which may unfold now or over the next few days, and the focus will be on trading set ups and not on teaching and learning Elliott wave. Analysis will be brief and to the point. 1. Always use a stop. 2. Never invest more than 1-5% of equity on any one trade. Trading is about probabilities, not certainties. Failure to follow my two Golden Rules of trading indicates failure to manage risk. So far upwards movement should be assumed to be a counter trend movement, until proven otherwise. The prior wave down put ADX into extreme and upwards movement from the 3rd of January has brought ADX back down from extreme. There is again room for a trend to develop. Single divergence with Stochastics on its own is not enough to indicate a high in place. A breach of a support line should be seen before entering short. Stockcharts do not offer volume data for currencies, so this is analysed below with BarChart data. The best fit channel is slightly adjusted to be more conservative than the last published chart for EURUSD. If price can print a full daily candlestick below the lower edge of the yellow channel, that would offer further confidence in a trend change. When that trend line is breached, then it should offer resistance. Stops may be set a little above the trend line offering a low risk high reward opportunity. Do not set stops too close to the line; allow the market room to move. Sometimes trend lines are overshot and this trend line is not perfect. On Balance Volume has confidently breached a horizontal support line which offers strong technical significance. A retest of resistance at that line shows it holds. This is a strong bearish signal. Classic technical analysis of this pair is very bearish. The long upper wick on this last daily candlestick is bearish. This trend is extreme; it will end sooner rather than later. On Balance Volume has no trend line. Any trend line drawn would have too steep a slope to have reasonable technical significance. If an expanding diagonal is unfolding, then minute iv must be either over now or very close indeed. There is almost no room left for it to move. I have been analysing NZDUSD (because I’m a Kiwi) for years using Elliott wave and I will note that NZDUSD rarely offers good looking Elliott wave structures. Therefore, I place more weight in classic analysis of this pair than Elliott wave analysis. 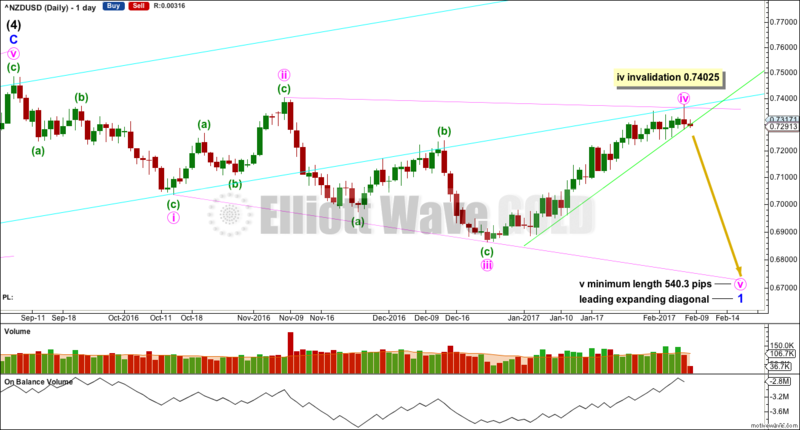 The Elliott wave analysis is supplementary. I will wait for the green support line to be fully breached before going short here. There is not enough bullish indication here to go long yet. Upwards movement on this chart is a clear trend and downwards movement is choppy and overlapping, so downwards movement looks more like a counter trend movement. If that conclusion is correct, then USD should break out upwards. 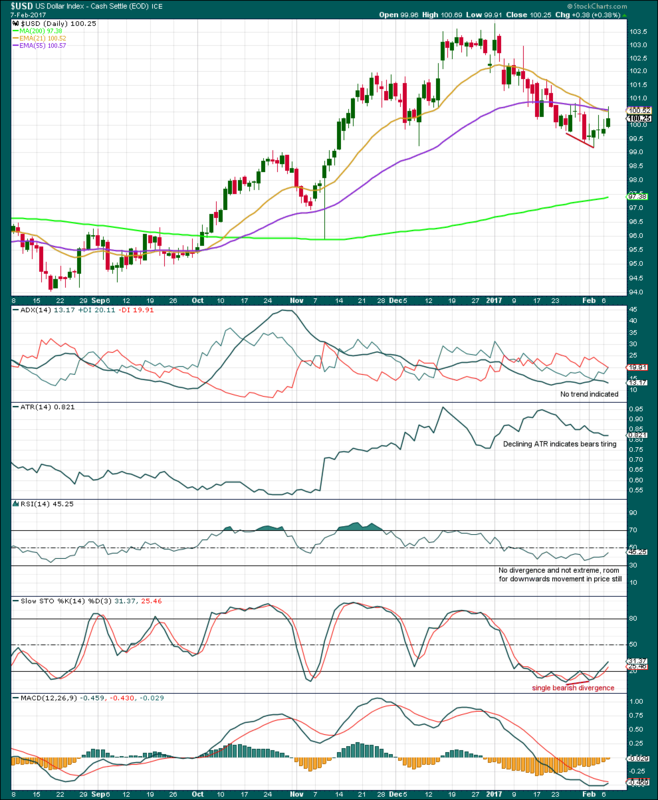 The larger trend at the monthly chart level remains up and the 200 day moving average still has a positive slope. Neither Stockcharts nor BarChart have volume data. The short term yellow resistance line has been breached. However, the long upper wicks on the last two daily candlesticks gives some cause for concern. Price may be bouncing up from the lower edge of the best fit channel. With another upwards day moving further away from the trend line, a long position may be entered. A stop may be set just below the last low. Next resistance is at 26.0. This chart is provided today mostly for members of Elliott Wave Gold and not because I see a trading set up here, because I don’t. (That doesn’t mean one does not exist, only that I don’t see it today). Going long here risks entering at the end of the trend. ADX is nearing extreme and price has closed above the upper edge of Bollinger Bands now for the last four sessions. Going short here is trying to pick a top. 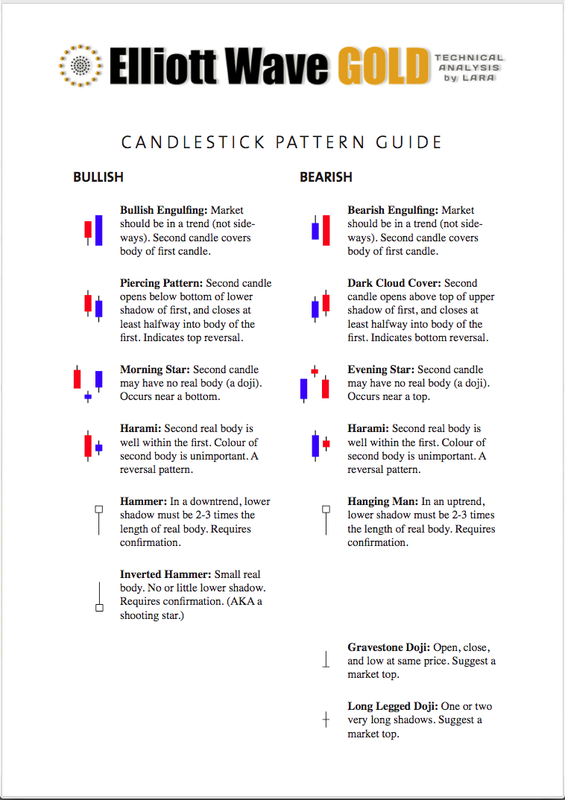 Before going short at least two of the following should be seen: a bearish candlestick pattern, a break of support by On Balance Volume, divergence with price from RSI while overbought, price to move below the short term 13 day moving average. This analysis is published @ 02:59 a.m. EST. 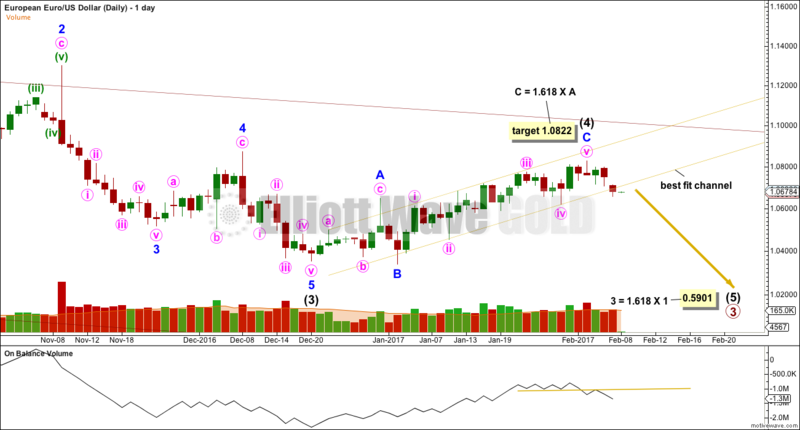 Today for GDX I have Elliott wave charts, classic weekly and daily technical analysis charts, and a brief summary. 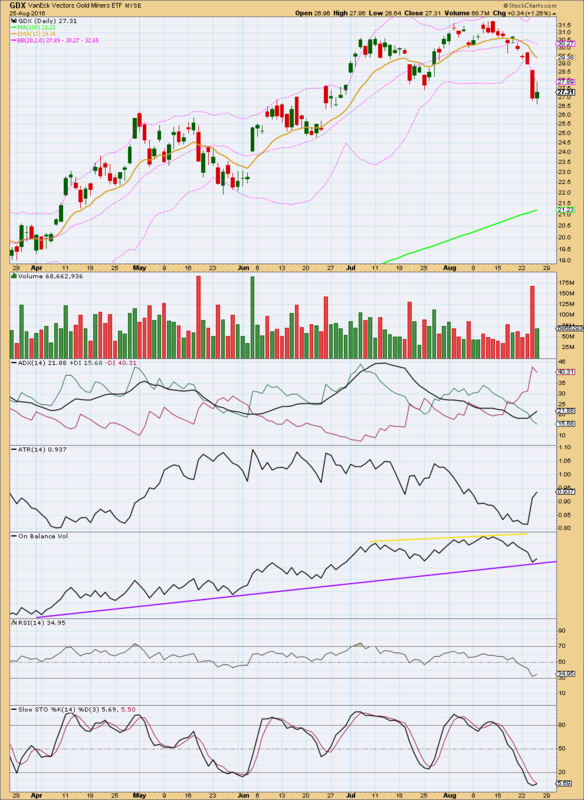 Last GDX analysis on 31st of August expected the downwards trend to be interrupted by a bounce. Price moved sideways for about four weeks, which fits expectations, and is now moving strongly lower. 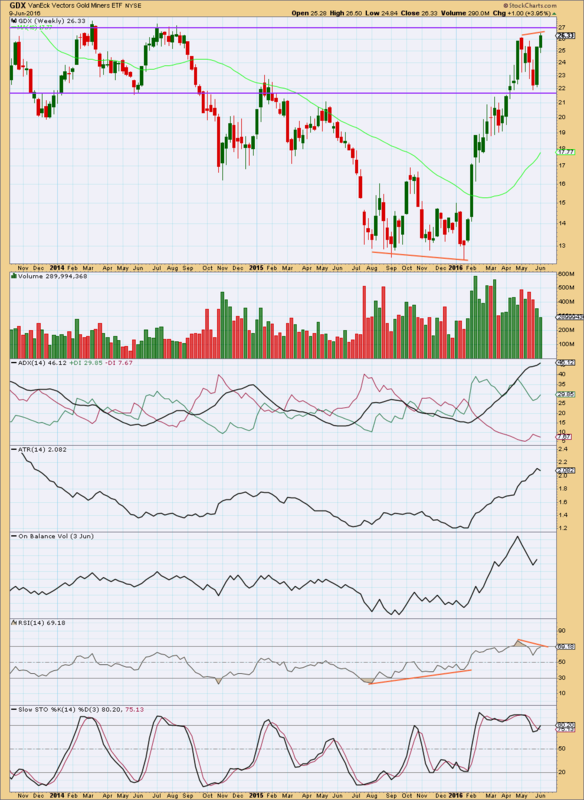 Last GDX technical analysis was very bearish. Last analysis expected upwards movement towards a target at 36.21. Price did move higher but fell 4.42 short of the target. Summary: Classic technical analysis is very bearish today for GDX. A downwards trend is in place. This strongly favours the alternate monthly and alternate daily wave counts. A new low below 26.17 would indicate a much deeper correction should continue for a B wave, likely to end below 14.339. A new high above 31.79 would indicate an impulse upwards is continuing, target 35.15 and limit 36.34. Although the wave counts are labelled “main” and “alternate”, the alternates are favoured. This is the order in which they were developed and not the order in which they are more likely. The whole wave down for cycle wave a subdivides well as a five wave impulse. 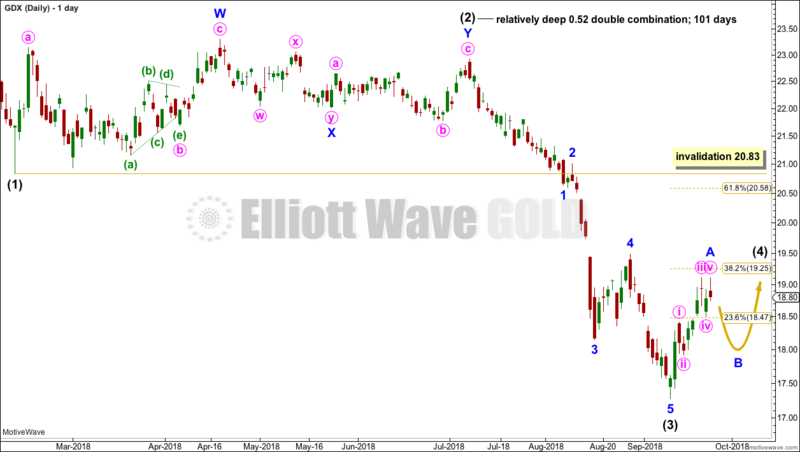 However, GDX does not have adequate volume to produce typical looking Elliott wave structures. As always, this wave count comes with the strong caveat that this market is not sufficient in volume for a reliable Elliott wave analysis. It is a rough guide only. 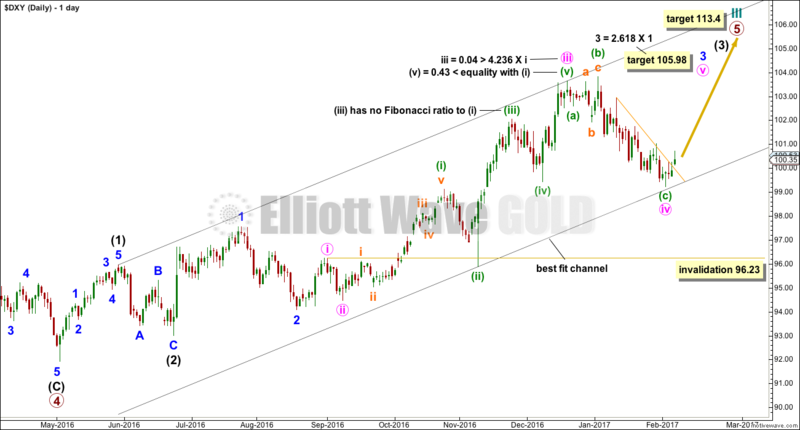 The direction expected from the Elliott wave count should be fairly reliable, but targets and invalidation points may not be. Ratios within cycle wave a are: there is no Fibonacci ratio between primary waves 1 and 3, and primary wave 5 is 0.33 short of 0.236 the length of primary wave 3. Ratios within primary wave 3 are: intermediate wave (3) is 3.48 short of 1.618 the length of intermediate wave (1), and intermediate wave (5) has no Fibonacci ratio to intermediate waves (3) or (1). Ratios within intermediate wave (3) are: minor wave 3 has no Fibonacci ratio to minor wave 1, and minor wave 5 is just 0.02 longer than equality in length with minor wave 1. Ratios within minor wave 3 are: minute wave iii is 0.38 longer than equality in length with minute wave i, and minute wave v has no Fibonacci ratio to either of minute waves i or iii. Within primary wave 5, there are no adequate Fibonacci ratios between intermediate waves (1), (3) and (5). The black channel is a best fit; this movement does not fit into an Elliott channel. The channel is breached very clearly and price has made a major new swing high above 17.04. A trend change was confirmed in February. 1. The bear market for GDX must be incomplete because a five may not be a corrective structure, so this must only be wave A. 2. 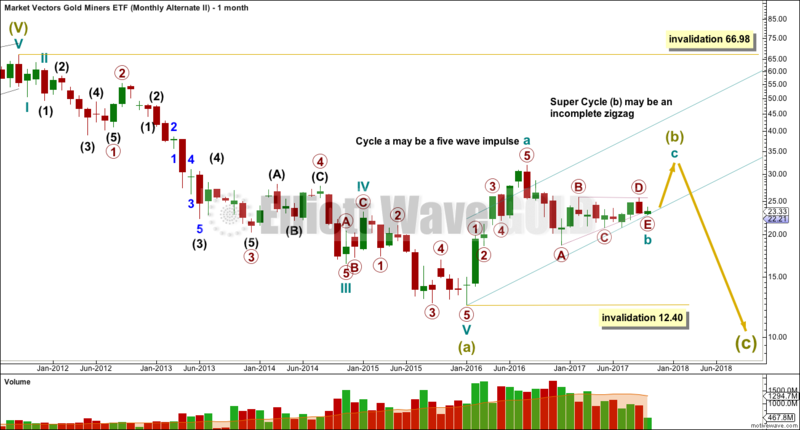 Cycle wave b may not make a new high above the start of cycle wave a at 66.98. 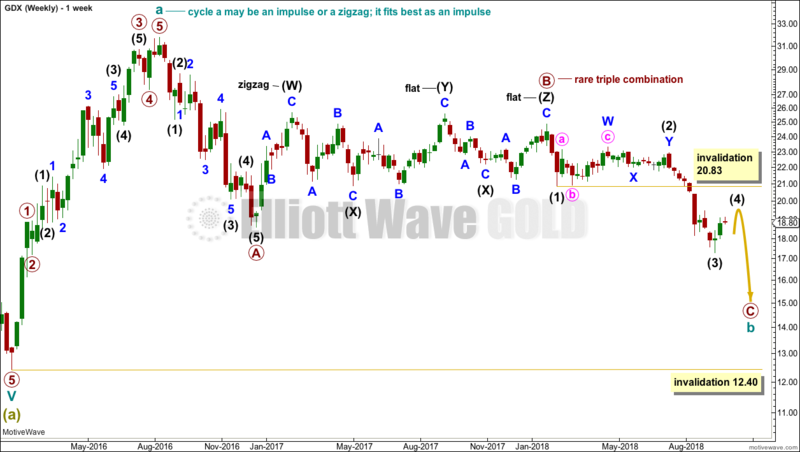 Cycle wave b may be any one of 23 possible corrective structures. It may be a swift sharp zigzag, or it may be a sideways structure such as a flat, combination or triangle. It should last one to several years. It is possible that it is over. An alternate at the end of this analysis looks at this possibility. The first movement up for cycle wave b must be a clear five wave structure for a trend of this magnitude. It looks like this completed at the Magee trend line where price found resistance and rebounded down. This line is now breached, providing further strong confidence that GDX is in a bull market for a longer term. If primary wave A is subdividing as a five and is incomplete, then intermediate wave (4) must end here. Intermediate wave (3) is shorter than intermediate wave (1). This limits intermediate wave (5) to no longer than equality in length with intermediate wave (3), so that the core Elliott wave rule stating a third wave may not be the shortest is met. This limit is at 36.34. At 35.15 intermediate wave (5) would reach 0.618 the length of intermediate wave (1). A new high above 31.79 would invalidate both alternates and provide strong confirmation of this first wave count. It is possible to see a 5-3-5 upwards complete. This may be a zigzag for primary wave A if cycle wave b is unfolding as a flat correction, or a zigzag labelled primary wave W if cycle wave b is unfolding as a double zigzag. If cycle wave b is a flat correction, then within it primary wave B must retrace a minimum 0.9 length of primary wave A. This minimum requirement for a flat correction would be met at 14.339. If cycle wave b is a double zigzag, then there is no minimum requirement for primary wave X within it; primary wave X needs to subdivide as a corrective structure. X waves within double zigzags are normally relatively brief and shallow. A new low below 26.17 would invalidate the main wave count and provide some confirmation of this alternate. It is possible that cycle wave b is now a complete zigzag. It may have ended just short of the 0.618 Fibonacci ratio and looks like a clear three wave structure on the monthly chart. If cycle wave a is a five and cycle wave b is a three, then cycle wave c downwards must subdivide as a five. 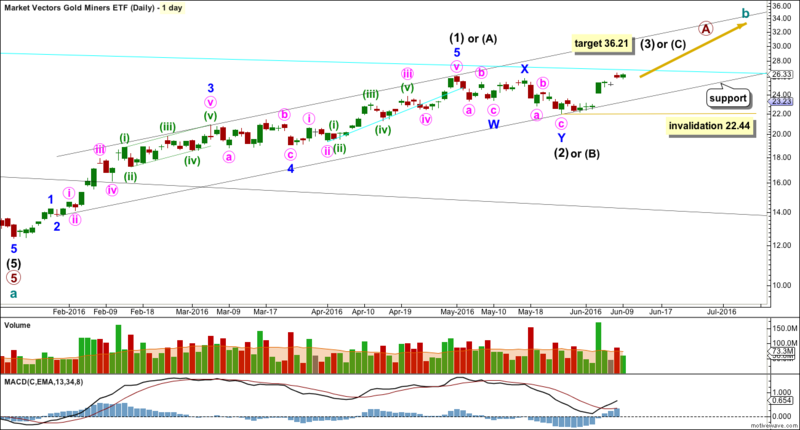 Within cycle wave c, no second wave correction may move beyond the start of its first wave above 31.79. In trying to calculate a target for cycle wave c the 0.382 Fibonacci ratio yields a truncation and the 0.618 Fibonacci ratio yields a negative value. Cycle wave c may not exhibit a Fibonacci ratio to cycle wave a. Cycle wave c would be very likely to make at least a slight new low below the end of cycle wave a at 12.40 to avoid a truncation. Price may find some support here about 25.10. However, price has moved strongly lower for the last two weeks to make an important new low below 27.45, and it has done so on increasing volume. Volume is supporting downwards movement. It is likely that price will continue lower. The next strong area of support is about 21.75. Overall, volume is declining as price has been moving higher since January. The rise in price is not supported well by volume. 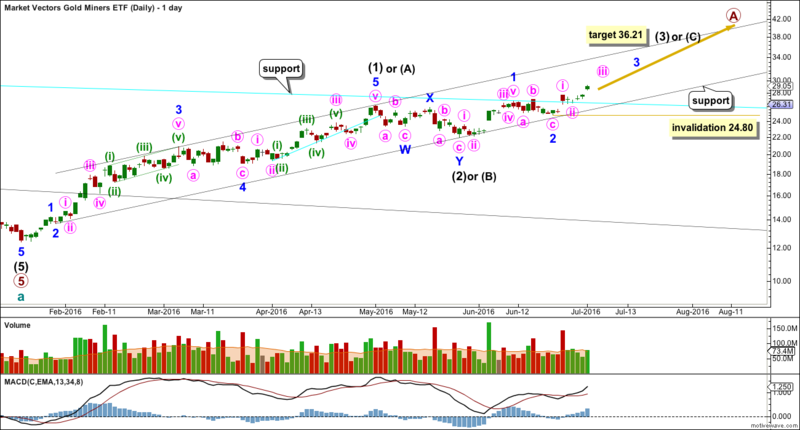 This favours a bearish outlook mid term for GDX. ATR has been strong and increasing. Now it is levelling off, so some decline would be expected. ADX is very extreme, well above 35, and is now declining. 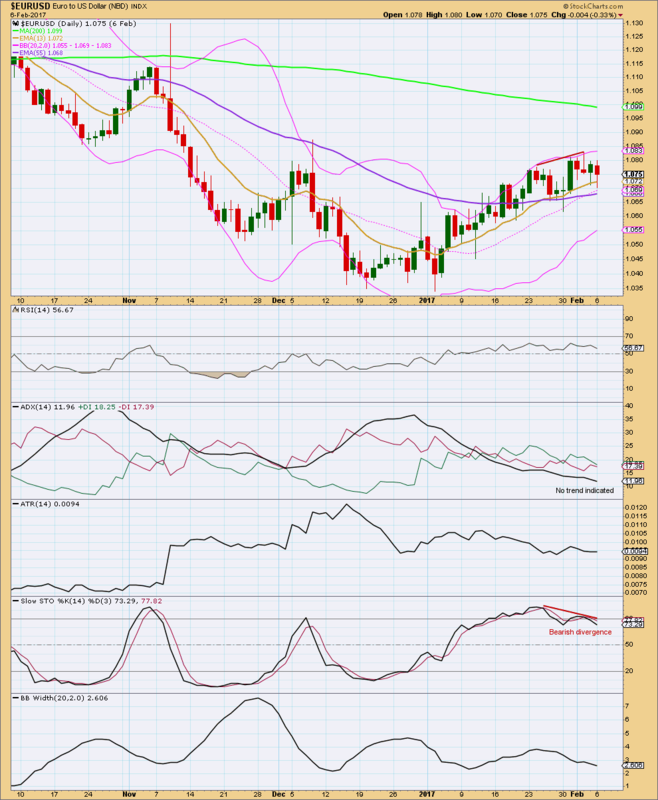 ADX is indicating the trend is most likely exhausted here for GDX but a trend change has not yet been indicated. 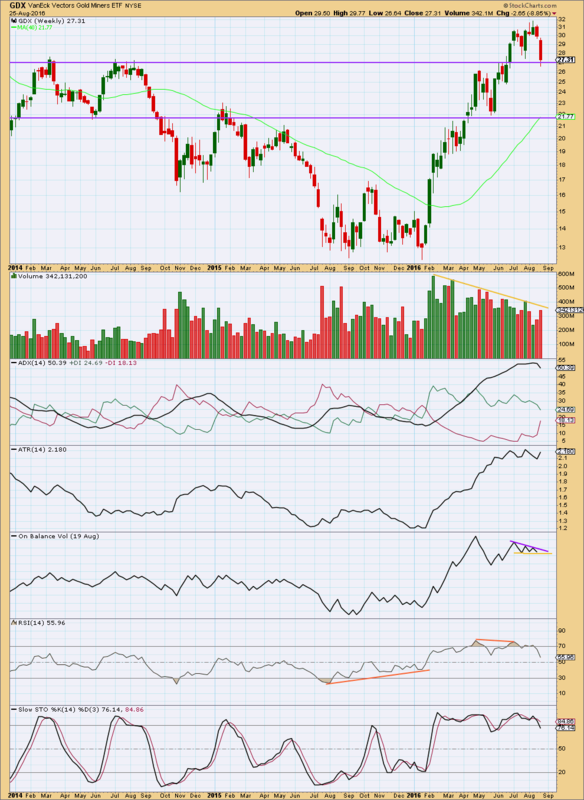 On Balance Volume is tightly constrained between the yellow support line and the purple resistance line. A breakout by OBV may indicate the next direction for price, short to mid term. 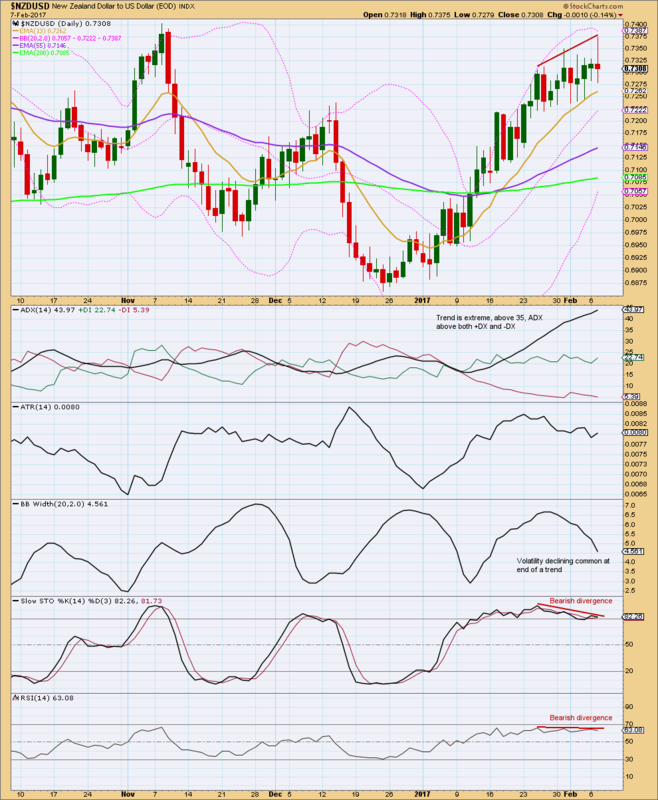 RSI is returning from overbought after exhibiting double negative divergence with price at the last high. Overall, this analysis is very bearish for GDX at this time. 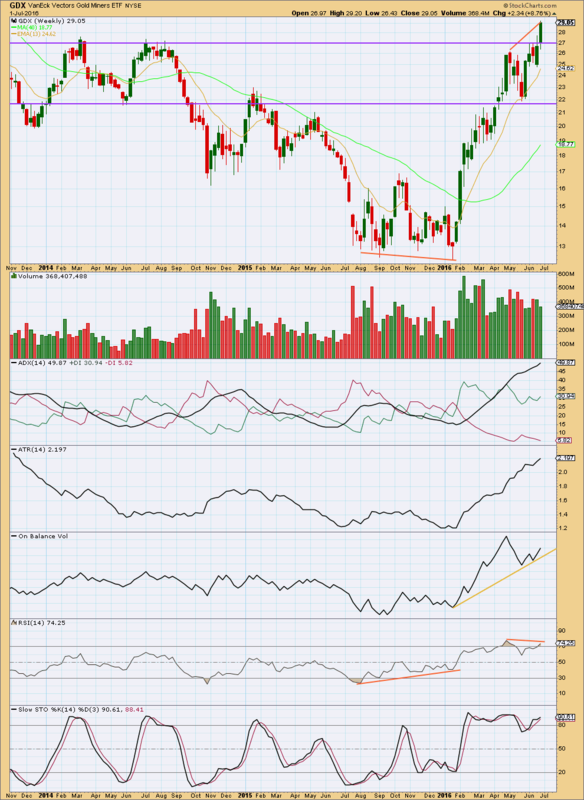 It looks like GDX has had a trend change: It has made an important new low, volume offers some support to downwards movement, and ADX indicates a downwards trend. ATR is now increasing again after some decline. With ATR and ADX in agreement, it should be assumed that GDX is in a downwards trend at this time. 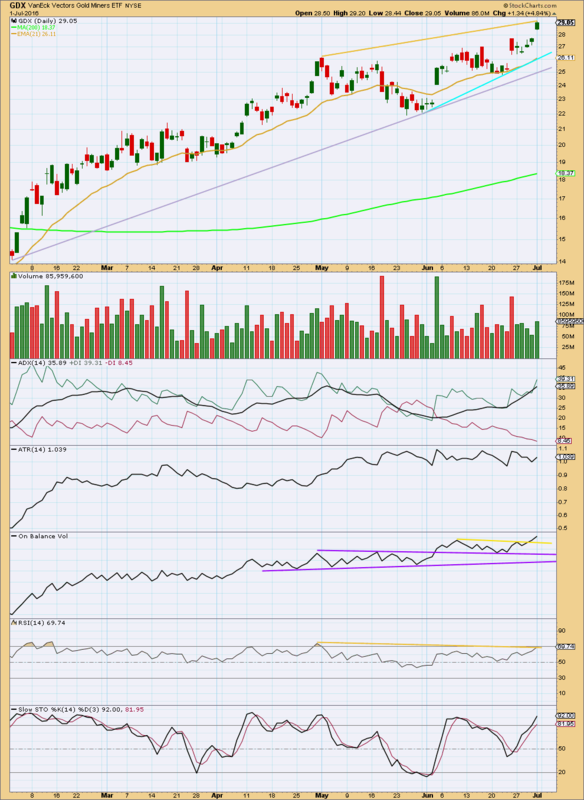 On Balance Volume is finding some support at the purple line. This is assisting to bounce up price. How price and OBV behave after this bounce will be indicative. If OBV breaks below the purple line it would be offering a strong bearish signal. With price right at the lower edge of the Bollinger Bands today, this may also assist to bounce up price. During a trend GDX can remain at an extreme of its Bollinger Bands for several days running though. RSI is not yet extreme. There is room for price to fall. A low may not be expected until RSI is extreme and then exhibits divergence with price. Stochastics is extreme, but this oscillator may remain extreme for reasonable periods of time during a trending market. It does not yet exhibit any divergence with price to indicate weakness. This analysis is published @ 01:38 a.m. EST. Last analysis expected overall upwards movement while price remained within a channel, towards a mid term target. Price has moved higher and remains within the channel. The target remains the same. Summary: A third wave up to 36.21 continues. 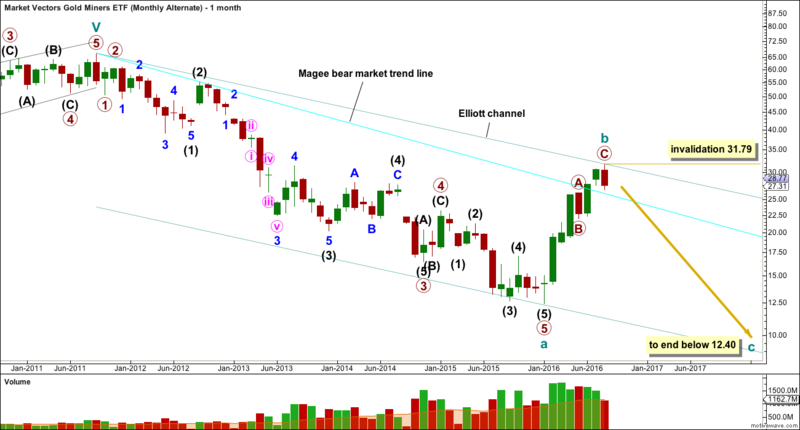 Downwards corrections should find support now at the lower edge of the black channel on the daily chart. If price breaks below the lower edge of the channel, the wave count would be in doubt. The invalidation point may now be moved up to 24.80. Cycle wave b may be any one of 23 possible corrective structures. It may be a swift sharp zigzag, or it may be a sideways structure such as a flat, combination or triangle. It should last one to several years. Primary wave A may be subdividing as a three or a five. If it is a five, it looks like an unfolding impulse. If it is a three, so far it looks like an unfolding zigzag. Both a zigzag and the start of an impulse subdivide 5-3-5, so at this stage it is not possible to determine which this may be. Both possibilities must be considered. At 36.21 intermediate wave (3) or (C) would reach equality in length with intermediate wave (1) or (A). Within minor wave 3, no second wave correction may move beyond the start of its first wave below 24.80. If this wave count is correct, then price should continue to find support at the lower edge of the black channel along the way up. The earliest warning this wave count may be wrong and the alternate below may be correct would be a breach of the lower edge of the black channel. If price breaks above the upper edge of the black channel, then intermediate wave (3) would be accelerating. It may complete a blowoff top at its end. A very strong upwards day with a strong volume spike may signal the end of intermediate wave (3). If price breaks below the lower edge of the black channel, then this wave count should be used. Assume the main wave count is correct while price remains within the black channel. It is possible that primary wave A was a complete impulse on 16th of July, and primary wave B began there as an expanded flat correction. If A is a five, then B may not move beyond its start below 12.40. Targets for primary wave B would be the 0.382 and 0.618 Fibonacci ratios at 20.07 and 16.70. If primary wave B is a flat correction, then within it intermediate wave (B) is so far 1.97 the length of intermediate wave (A). This is considerably longer than the normal range of up to 1.38, which reduces the probability of this wave count. 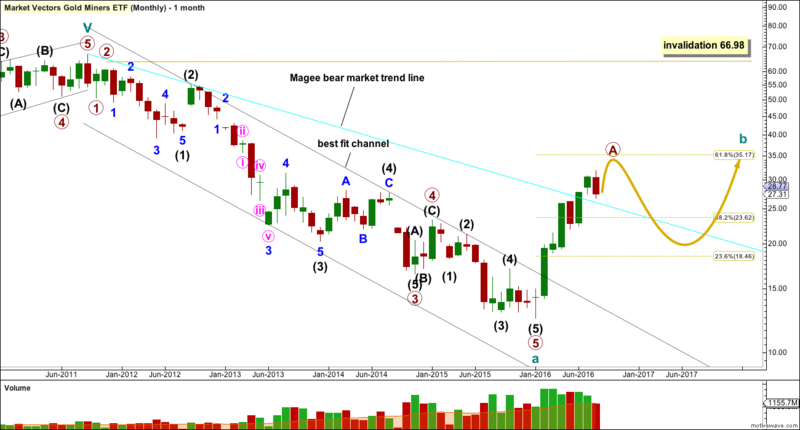 Above 29.26 intermediate wave (B) would be longer than 2 times the length of intermediate wave (A). At that stage, the idea of an expanded flat should be discarded due to an extremely low probability. At the weekly chart level, there was double bullish divergence between price and RSI at the low of January 2016. There is still single bearish divergence between price and RSI now at the current high. Volume for last week was reasonable, greater than the two prior upwards weeks but slightly less than the prior downwards week. ADX still indicates the longer term weekly trend is upwards. ATR agrees as it is increasing. However, ADX is now over 45, so the trend is extreme. Caution is advised. If the market is still trending, then price should find support about the 13 week moving average. A clear break below this average would indicate a larger correction may have arrived. 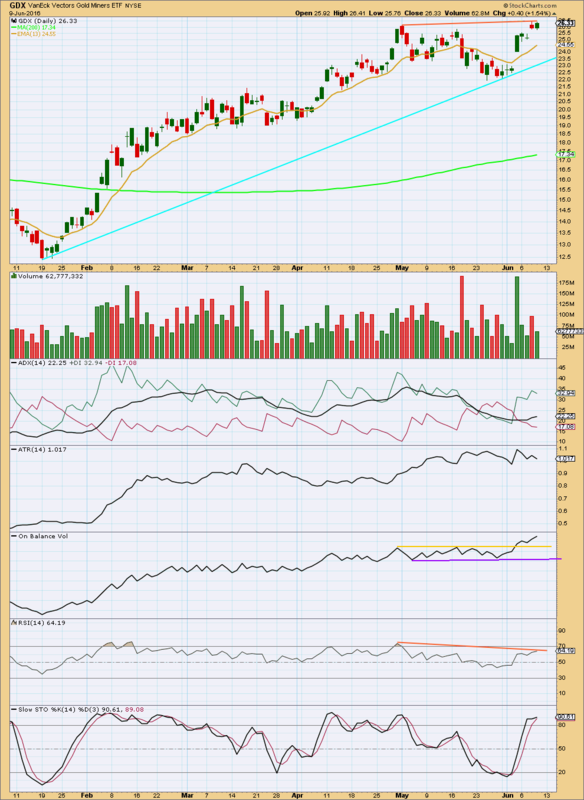 On Balance Volume is finding support at the yellow line. A break below this line would indicate price should move strongly lower for a deeper correction. In the first instance, it should be expected that OBV may find support at the line if it comes down to it again. There is also divergence between price and Stochastics at the last two highs. This indicates some weakness. Price may continue to find support at the cyan trend line. If that is breached, then it may find support at the lilac trend line. On 1st of July (the last day of data from StockCharts), volume supported the upwards movement in price. At the daily chart level, ADX is not extreme. ADX indicates there is an upwards trend in place. ATR neither agrees nor disagrees; it is flat. It should be assumed that there is still an upwards trend until ADX turns down or price breaks below support. On Balance Volume has given a very recent strong bullish signal with a break above both yellow lines. RSI and price exhibit bearish divergence (yellow lines). This indicates upwards movement may be weakening, a correction may arrive soon. This analysis is published @ 04:08 a.m. EST. Last analysis on 9th of April expected downwards movement to 17.67 – 17.11. Price moved higher up to 26.17 at the end of April, then turned down for a shallow correction ending 22.44 by the end of May. Summary: The trend remains the same until proven otherwise. 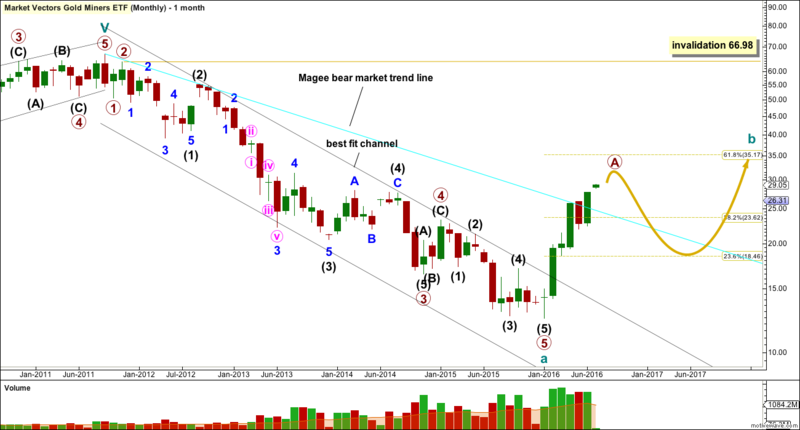 While price remains within the channel on the daily chart the target is 36.21. This upwards trend is currently showing weakness. A break below the black trend channel on the daily chart would indicate a deeper longer lasting correction may have arrived. It would be confirmed by price with a new low below 22.44. The first movement up for cycle wave b must be a clear five wave structure for a trend of this magnitude. It is possible that it is complete and finding resistance at the Magee bear market trend line. If a larger correction begins from here, then targets would be the 0.382 and 0.618 Fibonacci ratios at 19.83 and 16.57. I have two daily wave counts. Volume and divergence with RSI indicate the alternate is more likely, but the trend should still be assumed until proven otherwise. The alternate should remain an alternate until price indicates it is correct with a breach of the channel on the main daily chart. So far a 5-3 is complete. The next wave up should subdivide as a five. At 36.21 intermediate wave (3) or (C) would reach equality in length with intermediate wave (1) or (A). 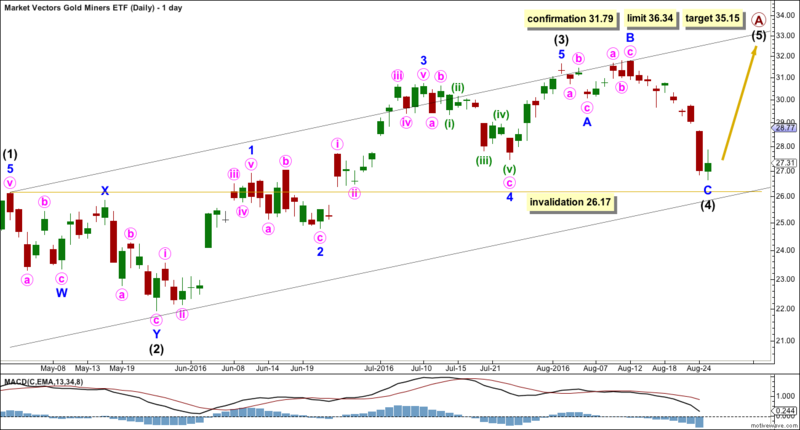 Within intermediate wave (3) or (C), no second wave correction may move beyond the start of its first wave below 22.44. At this stage, price may find strong resistance at the copy of the cyan trend line from the weekly chart. If price can break above this trend line, then the probability of this main wave count would increase over the alternate below. It is also possible that a five up is either complete or close to completion. If primary wave A subdivides as a five, then cycle wave b would be subdividing as a zigzag (or zigzag multiple). Intermediate wave (3) is shorter than intermediate wave (1). This limits intermediate wave (5) to no longer than equality in length with intermediate wave (3), so that the rule regarding a third wave not being the shortest is met. This limit is at 29.09. The first indication this alternate wave count may be correct would be a breach of the lower edge of the black channel. If that happens, then draw a Fibonacci retracement along the length of primary wave A. Use the 0.382 and 0.618 Fibonacci ratios as targets for primary wave B. If primary wave A is a five wave structure, then primary wave B may not move beyond the start of primary wave A below 12.40. There is single bearish divergence between price and RSI now at the current high. Volume is declining (although at the time of publication the last week still has the session for Friday to add to it). ADX still indicates the longer term weekly trend is upwards. ATR agrees as it is increasing. At the end of this week (unless Friday is a spectacular upwards day), it looks like price and On Balance Volume will also exhibit bearish divergence. Divergence is a warning of weakness. A trend change should be expected soon, but not necessarily now. It should be expected that the trend remains up while price remains above the cyan trend line. Also, while the shorter 13 day moving average remains above the longer 21 day moving average, it should be expected that the trend remains up. Price should find support about the 13 day MA. ADX is indicating there is an upwards trend. There is still room for the trend to run. ADX is between 25 and 45 indicating a strong trend, not yet extreme. On Balance Volume is bullish. There is some indication of weakness with divergence between price and RSI from the high of 2nd May to the high of 8th of June. RSI is usually a fairly reliable indicator of trend weakness, but it can continue and develop as double divergence (or occasionally triple) before a trend change actually occurs. This analysis is published @ 02:41 a.m. EST on 10th June, 2016.